Collection History: Dr. J. Edwin Hengst was a Baltimore pharmacist. Physical Description: 390 photographs in 1 album. 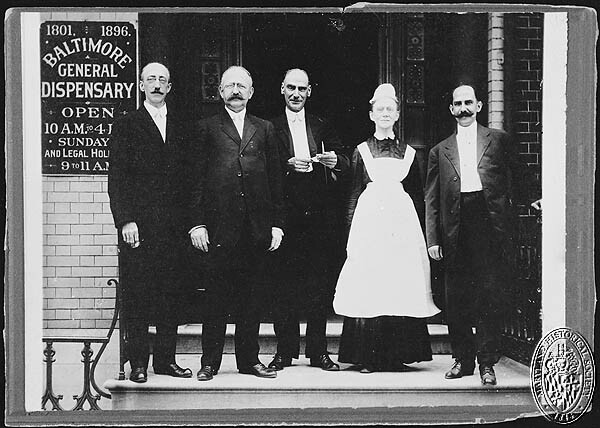 Subjects: Dr. Hengst’s drug stores at Central Avenue and Gay St. and Monument and Ensor Streets. His family, friends, and pets and their Old Town, Baltimore neighborhood. Ashland Square, Madison Square , Thaler’s Stove Company, and Central Ave. Included are interesting views of the drugstore interiors, neighborhood saloons, Baltimore schools, (Samuel Ready School, Eastern and Western High Schools) churches and parks, the East Baltimore Driving Association, and extensive scenes of Loudon Park cemetery plots. Winter scenes include the 1899 Blizzard, a Christmas garden, and winter sports.